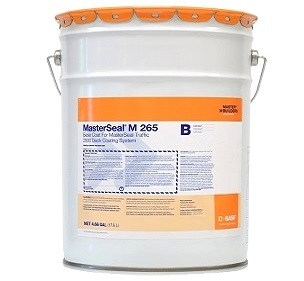 PRODUCT: MasterSeal M 265 Traffic-Grade Waterproofing Basecoat (formerly Conipur 265Z). 2-Part Fast-Curing High Solids Polyurethane Base Coat. 4.66 Net Gallon Kit. Price/Kit. APPLICATIONS: Use on high-traffic areas including parking ramps, mechanical rooms, stadiums, balconies, plaza decks, balcony decks etc. Substrates: Exterior-grade plywood or concrete. Not for use over asphalt or bitumen type surfaces. Locations: Interior or Exterior, Above Grade. A TWO component fast-curing traffic grade polyurethane waterproofing basecoat. Quick Return to Service: Cures in 3-4 hours at 70F. Cures in cool weather, down to 40F. Very low odor. Suitable for occupied application areas. Very Durable: Can be used for vehicular or pedestrian traffic. High Solids: 99%. Excellent chemical resistance. Protects against common deck chemicals including gasoline, diesel fuel, oil, alcohol, ethylene glycol, de-icing salts, bleach and cleaning agents. 265-M basecoat is used in conjunction with a conipur 78 Primer and MasterSeal 275 or 285 Topcoat, or Sonoguard Topcoat to form a finished system. Topcoat Colors: Topcoats are available in GRAY and CHARCOAL GRAY (topcoats not included in this kit). Yield and Applications: See Product Datasheet. #2/12 DECK COAT SAND, GRADED TO #2/12 SIZE, CLEANED & KILN DRIED. LAPID LUSTRE FROM MONTEREY BEACHES. SIZED FOR VEHICULAR DECKS. 100 LB. Bag. Price/Bag. #2-/16 Sand (Pedestrian Deck Coat Grade). Lapis Lustre from Monterey beaches. Graded to #2-/16 size, cleaned, kiln dried, rounded crystal-silica Monterey sand. Sold by the pound for small jobs. Price/Pound. #2-/16 Sand (Pedestrian Deck Coat Grade). Lapis Lustre from Monterey beaches. Graded to #2-/16 size, cleaned, kiln dried, rounded crystal-silica Monterey sand. HANDY 50-LB BAG. Price/Bag. ULTRA LOW-RISE DECKING FACE METAL. 2 INCH FACE X 4 INCH TOP, 1/16 RISE, 1/4 DRIP ON FACE. 26 GAUGE GALVANZIED STEEL. 10 FEET LONG. PRICE/PIECE. 4 inch Wide DOUBLE-THICK (0.65 inch) Natural-Bristle Paint Brush / Chip Brush, set in Wood Handle. Price/Brush. Paint Roller Cover, 9-inch, 3/8 nap, 1-1/2 ID, Solvent Resistant Polyester NPa and Core. For use wiht all types of coatings including solvent based coatings, epoxies, and urethanes. Price/Each. MasterSeal TC 295 (formerly Conipur 295) Waterproofing Topcoat, CHARCOAL COLOR, 2-part Fast Curing, UV resistant Exterior Grade, Low VOC. Very High Durability. 4.78G/Kit. Price/Kit. MasterSeal TC 295 (formerly Conipur 295) Waterproofing Topcoat, GRAY COLOR, 2-part Fast Curing, UV resistant Exterior Grade, Low VOC. Very High Durability. 4.78G/Kit. Price/Kit. NITRILE CHEMICAL GLOVE, VERY HEAVY-DUTY 15 MIL NITRILE, POWDER FREE, TEXTURED, UNLINED, 13 INCH NO-CUFF, LARGE, INDIVIDUALLY WRAPPED PAIRS. PRICE/PAIR. Paint Roller Frame, 9 Inch Wide, Heavy Duty with 5 Wire Frame, 5/16 Inch Stem, Steel Reinforced Threaded Handle. Price/Each. Rubber Granules, #14/30, Off-White Color, 50-Lb. RUBBER GRANULES, OFF-WHITE COLOR, #14/30 MESH SIZE,(FOR WALK-DECKS, ACTIVITY COURTS, ETC). 50-LB/BAG. PRICE/BAG. SQUEEGEE, 18 INCH WIDE, 1/4 SERRATED (V-notched), GRAY EPDM, REPLACEABLE BLADE TYPE, SET IN HEAVY DUTY STEEL FRAME. PRICE/EACH. SQUEEGEE, 18 INCH WIDE WITH 3/16 SERRATED (V-notched), GRAY EPDM RUBBER, REPLACEABLE BLADE TYPE, SET IN HEAVY DUTY STEEL FRAME. RECOMMENDED FOR USE WITH DECK COATINGS. PRICE/EACH. Super Seam Tape. High-Strength Instant-Bonding Seam Reinforcement Tape. Acrylic adhesive with glass cloth. White Color, 4-inch Wide x 36 Yard Roll (108'). Price/Roll.